Steep Rock Association in Washington, CT. is nestled in along the Shepaug River surrounded by high hills creating a unique world that offers a hiker a wide range of experiences. River walks, fantastic views, serene woodlands, old utility roads / railroad tunnel, and a horse farm await those who are eager to venture out. Steep Rock Association is just a mile from the center of Washington Depot with its various shops, restaurants, and local government buildings. Therefore, it's a favorite place for locals to hike, fish, swim, run their dogs, and just relax along the riverbanks. There are several trails available that create miles and miles of possibilities. If you're in good shape you can take in the whole trail system in a day but it's probably best just to pick the yellow trail loop or a shorter one if you want a nice hike without worrying about overextending yourself. A highlight of the yellow trail system is the Steep Rock overlook. At the trailhead carefully study the map and you'll see that the yellow trail heads up to the right from the main trail that heads straight into the park. Follow the yellow markings up to Steep Rock overlook. The overlook offers magnificent views of the valley below as the Shepaug River bends and twists its way through. When you reach the top of Steep Rock you'll notice a fence has been erected for your safety. There is a serious drop off here so go slowly and stay within the fenced area and you'll be fine. If you look down at the base of the fence as you look out over the valley you'll notice a plaque at the base of the fence and you'll soon understand why the fence is there. In 1963 a 10 year old boy lost his life here when he fell over the cliff. His family created this very touching memorial to this beautiful little boy and helped finance the building of the fence. It's a reminder to us all that we should keep that childlike adventurous spirit alive but proceed with extreme caution at certain points along our hikes. All of us who have hiked up to Steep Rock owe this family a debt of gratitude. There's no doubt the fence has saved lives. The views from Steep Rock are great and on a warm sunny days, large turkey vultures use the valley and ride the thermals up into the sky. If you sit still they'll cruise right over your head nearly within arms length, as if they're just having a good look at you and showing off their graceful flying skills. After the overlook you can hike back down to the valley and explore the river's edge. Follow the yellow trail as it proceeds along the Shepaug and cross over the great wooden footbridge. Hike over to the old railroad tunnel to get an interesting view of a world long since gone. The tunnel was built because from an engineering standpoint, it was easier to go through the hill rather than over and around the steep slopes that are prevalent throughout Steep Rock. Eventually the yellow trail winds back around to the horse farm and the entrance where you hike began. Directions: Steep Rock's website: http://www.steeprockassoc.org Depending upon the direction you're coming from there are many ways to get to Washington Depot, CT. The following instructions start in New Milford, CT and head north on Route 202. Take 202 north out of New Milford center. New Milford Hospital and police station will pass by on your left hand side. A couple miles up on Route 202 will be your first traffic light. Take a right here onto Route 109. 109 winds, twists and bends its way through the countryside so please drive slowly as the road can be dangerous to those not familiar with it. Follow Route 109 all the way to the center of Washington Depot. At the first 4-way intersection in the center of town take a right onto River Road. 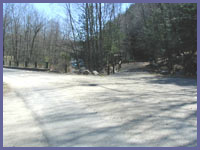 Stay with River Road as it follows the Shepaug River and brings you to the dirt parking lot entrance of Steep Rock Association.